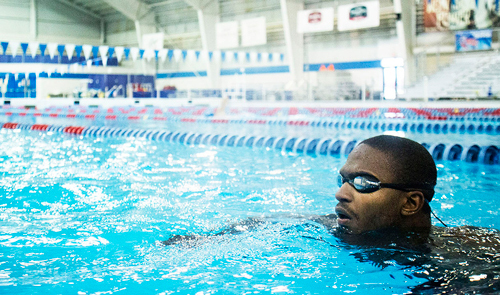 Community member Giles Smith swims laps in OCCC’s Aquatic Center on March 27. The Olympic-size pool and diving well are free to students with a valid OCCC ID and to the community for a small fee. For more information, visit www.occc.edu/rf/wellness . 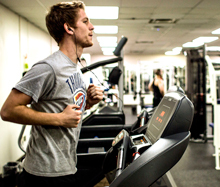 Students can get fit for free at OCCC. In fact, all students, faculty and staff can use any of the facilities in the Wellness Center, located at the southwest side of campus on the first floor, said Recreation and Fitness Director Mike Shugart. Theater arts major Neil Newby exercises on a treadmill located in OCCC’s Wellness Center. “They’re welcome to use the Aquatic Center, all of the aerobics classes, the weight room and the basketball gym — all of it’s free,” he said. The Wellness Center features a 15,000-square-foot gym with two basketball courts and one recreational volleyball court, a cardio room with three treadmills, two cross trainers and two recumbent bikes as well as a weight room featuring a complete circuit of Cybex equipment and free weights, according to www.occc.edu/rf . Pre-education major Mitchell Richards takes part in a Circuit Training class offered at OCCC’s Wellness Center. Shugart said the weight room is the busiest during the day. However, he said, regardless of how busy any area is, all students who show up will be accommodated. Shugart said his personal favorite is the weight room, where, he said, he works out every day. 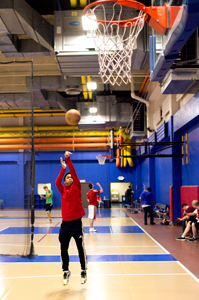 Diversified studies major William Maeriaga shoots baskets in OCCC’s gym. “I’m just trying to get better,” he said. Balls are available on-site. The Wellness Center is open from 6 a.m. to 9 p.m. Monday through Friday, and from 8 a.m. to 4 p.m. Saturday. The Aquatic Center, built in 1989 for the Olympic Festival games, features two 25-yard pools available for lap swimming and water walking, and a diving well with 1- and 3-meter spring boards, and 5-, 7- and 10-meter platforms, the website shows. Aquatic Center hours vary and are listed at www.occc.edu/rf/aquatic-hours.html . The area also is open to the public. A variety of passes, including a family or day pass, is available. For a complete list of pricing, visit www.occc.edu/rf/memberships.html . For more information, contact 405-682-7860 for Recreation and Fitness.